What is an “ant plant”? Because we are striving to portray a “real” tropical rainforest, we have several and plants at the Cockrell Butterfly Center, but what makes them so special? Technically called myrmecophytes (from the Greek myrmeco – “ant”, and phyte – “plant”), these plants have a very special relationship with ants, one that is beneficial to both parties. Such mutually beneficial partnerships are known as symbioses or mutualisms, and they are fascinating to evolutionary biologists, ecologists, and lay people alike. So-called “ant plants” typically provide shelter, and sometimes food as well, for ants, and the ants taking advantage of these resources in turn defend the plant against herbivores or other threatening animals, and sometimes even against competing plants. In some cases the ants may provide their host plant with nutrients. Ants take shelter inside the passages within the swollen stem of this Hyndophytum formicarum. Examples of ant plants abound, particularly in the tropics. They occur in many different families of plants, and involve many different species of ant. Some plant-ant combinations are specific – i.e., the plant has co-evolved with a specific species of ant. In such cases this ant is usually found nowhere else: it has an obligate mutualism with its plant host. Often the plant has difficulty surviving on its own as well. More common are facultative mutualisms, where plants provide a resource (usually food) that a variety of ant species may visit. Simply by virtue of their presence on the plant, these ants discourage (or attack) herbivores or other organisms that might harm the plant. 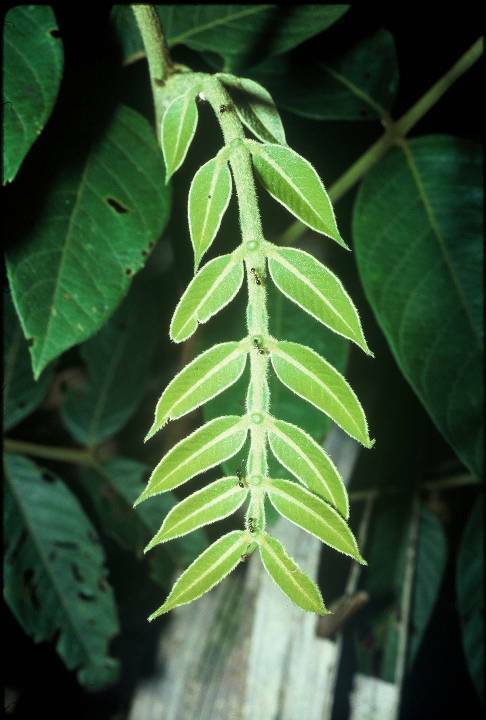 Hundreds of plants bear extrafloral nectaries. 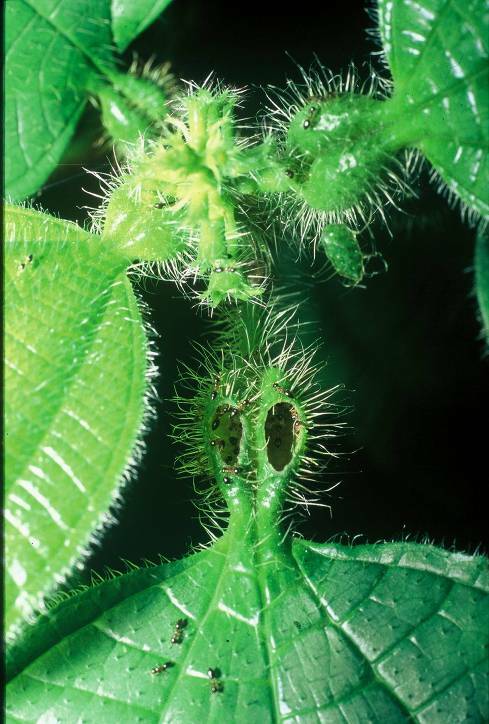 These nectar-secreting glands on structures outside of the flower (usually on leaves or the petioles of leaves) are typically most active on new growth, which most needs defense against hungry herbivores. Ants gather at the nectaries to collect the sugary fluid they exude, and kill or chase off insects that try to eat the leaf. Ants taking nutrition from extrafloral nectaries on an Inga leaf. Less common, but still with plenty of examples especially in tropical areas, are plants that provide shelter for ants. These domatia may be hollow stems, swollen petioles, or other hollow spaces on the plant that ants can use as living space. A few neotropical shrubs in the large genus Piper (black pepper family) have evolved large, envelope-like petioles that house a species of Pheidole ant. Tiny pearl bodies (lipid-containing food bodies) are produced on the inside surface of these domatia – at least when the ants are present. These tiny ants are not aggressive and would not seem to be very effective defenders of their host; however, they have been observed removing insect eggs and small larvae. The real benefit to the host plant appears to be the extra nitrogen that the plants absorb from waste (feces, dead bodies, and other debris) left by the ants inside the petioles. Ants taking shelter within the domatia of a Miconia petiole. Two shrubs in the coffee family, Hydnophytum and Myrmecodia, have very large and complicated domatia. The stems of these epiphytes from the mangrove forests of tropical Southeast Asia and Australia are lumpy and swollen, and almost look diseased. These bizarre-looking structures are riddled on the inside with hollow chambers, much like a Swiss cheese. If you cut one of the tubers in half, you will find that some of the chambers have smooth surfaces, while others have darker, rough surfaces. The inhabiting ants use the smooth chambers for living space and the rough chambers for dumping their trash. Biologists have observed that the rough-walled chambers are able to absorb nitrogen and other nutrients from the decomposing wastes deposited in them by the ants, while the smooth-walled chambers are not absorbent. Since it is always a challenge for plants without roots in the ground to get enough nutrients high up in the treetops, this is a great adaptation to enhance these epiphytes’ survival. And, not only do the ants provide the plant with extra nutrition – their presence serves to deter things that might eat it. Enlarged and swollen stipules on an ant acacia offer shelter for a colony of Pseudomyrmex, an ant species found nowhere else but this plant. The ant-plant mutualisms that really capture our imagination are those obligate mutualisms where the plant provides both food and shelter for the ants, and the ants are particularly fierce defenders of their plant host. One of the most famous ant-plants is the bull-thorn acacia from the dry forests of Central America. Acacia is a very large genus of plants in the legume family, especially abundant in dry tropical areas of the world. 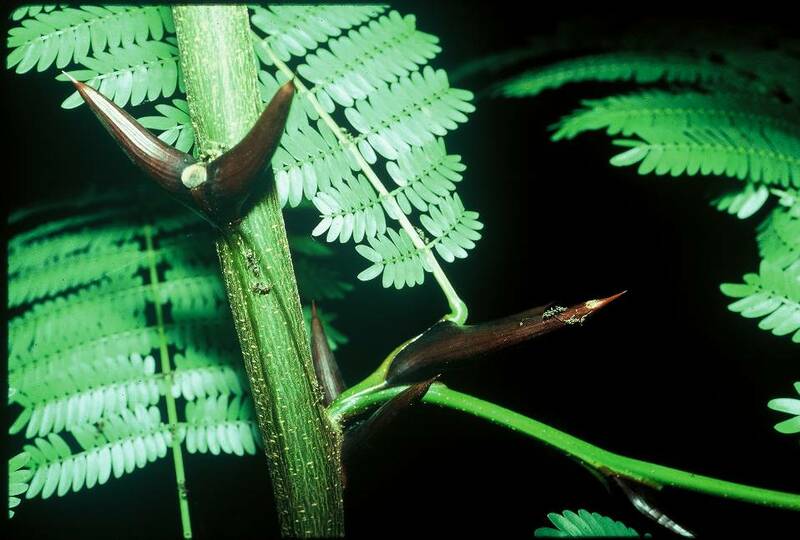 All Acacia species are characterized by having their paired stipules (little flaps of tissue at the base of each leaf, found throughout the legume family) modified into spines or thorns. In the Acacia species associated with ants, these thorns have become very large and swollen, resembling a pair of bull’s horns. A specific species of stinging ants in the genus Pseudomyrmex has evolved as an obligate mutualist of these acacias. Worker ants make a small hole at the tip of one of the horns, hollowing out an interior, and the colony lives inside these chambers. These ants are found nowhere else. The bull-thorn acacia also provides its ant inhabitants with food. Like many legumes, acacias have extrafloral nectaries. In this case, they take the form of little slits along the main rachis of the compound leaf. Ant-acacias don’t just feed their ants sugar, however; they also produce small, protein-rich food bodies for the ants on the tips of the new leaflets. The ants thus have all their needs for shelter and food provided by their host plant. In return, the ants vigorously defend their home against anything that threatens it – leaf-feeding insects or other animals – swarming out of the thorns and stinging the intruder. Because these ants also bite and sting any plant that touches or grows too close to their home, they reduce competition to their host from other plants as well, and because tropical dry forests often burn, the vegetation-free circles around the ant-acacia may be particularly important as a fire brake. Evidence for how much bull-thorn acacias rely on their fierce little ant defenders can be discerned by tasting the leaves. While most Acacia species are full of bitter compounds, ant-acacias have little need to maintain these chemical defenses, and no longer produce them. Their leaves are not bitter. But if the ant-acacia should lose its ant colony, it is liable to be hit hard by hungry herbivores. A species of Azteca ants takes shelter inside the hollow stems of Cecropia plants like this one. The famous British naturalist Thomas Belt first described this amazing symbiosis, which he observed during his sojourn in Nicaragua in the mid 1800s. Today the food bodies borne at the tips of the new leaflets are called “Beltian bodies” in his honor. A similar scenario, also from from the Neotropics, is seen in the relationship between several species of Cecropia (a fast-growing, early successional tree) and a species of Azteca ants. 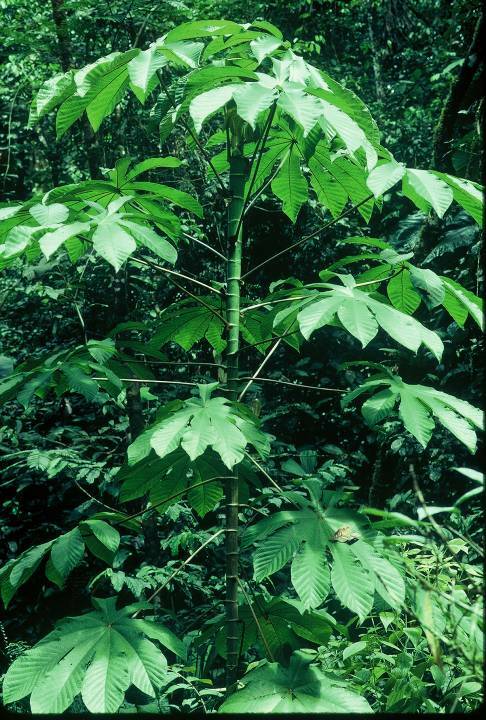 Cecropia has hollow stems – with special thin skinned “dimples” in the stem opposite each leaf. A queen Azteca who finds a young Cecropia not yet colonized bores her way through this thin spot (called a prostoma). The eggs she lays inside the stem hatch into worker ants, who tunnel through the membranes that divide the stem at each node, and open up more of the prostomata, giving them access to the outside. As the tree grows, the colony moves upwards, eventually making the whole tree a long, hollow shelter for the colony. Cecropia trees also provide food bodies for the ants; these “Mullerian bodies” (named for another 18th century European biologist, Fritz Muller) are produced on special spongy structures at the base of each leaf petiole. 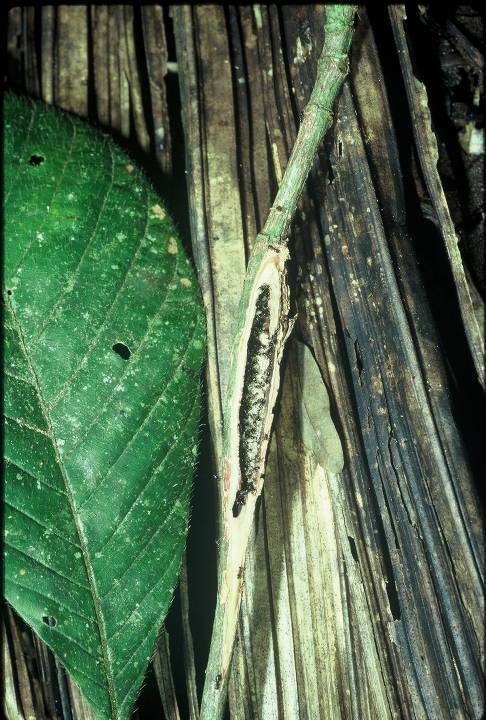 The occupying ants also bring small homopterans (aphid relatives) inside the stems of the Cecropia, where they feed on the plant’s sap in a protected environment. The ants milk these small insects for their sugary exudate (called honeydew) just like farmers milk cows. Azteca ants do not sting, but they can bite, and the workers swarm out in huge numbers to attack any animal that touches their plant. Cutting into a hollow stem shows just how extensive the ant colony runs inside this plant. A relationship very similar to the New World Cecropia-Azteca mutualism is found in the Old World tree Macaranga, also an early successional species, but in the spurge family, a completely different plant family from Cecropia. The ants inhabiting these plants are members of the ant genus Crematogaster (unrelated to Azteca). This is a great example of what is called convergence in evolutionary terms, whereby similar situations in different locations give rise to the same adaptive solutions among unrelated organisms. Ants are amazing little creatures, and their complicated social behaviors, which often seem to mimic ours, make them particularly good partners for plants in the fight for survival. Look for the bull-thorn Acacia (sans ants, unfortunately) next time you visit the Cockrell Butterfly Center. We recently received a specimen of Hydnophytum and of Mymecodia from a generous donor. These will eventually be placed in the rainforest. Our Cecropia tree, alas, got too big and died a few years ago. We hope one day to replace it! I have bull ants colonizing under one of my flowering plants which I don’t know the name of at any rate I need to know is it beneficiary to the plant because when I lift the entire plant up you can see tiny holes everywhere where I know they’re making colonies I need to know is it beneficial to the plant or is it killing the plant? Are you writing us from Australia? I don’t believe there are bull ants in North America. 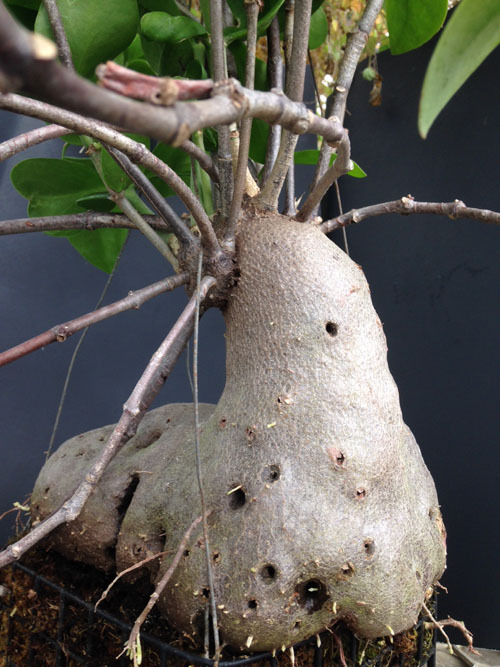 I would be a bit surprised if they were colonizing a house plant… In any case, ants don’t hurt plants for the most part (unless they are leafcutter ants), and in some cases can defend them from herbivores, but if they are nesting in a pot I would probably get rid of them. We get fire ant colonies in some of our greenhouse plants and getting stung by those girls is no fun. So unless you are fond of whatever ants you have, I would probably get rid of them!